Michael Andrew Fox was born in Edmonton, Canada in 1961. 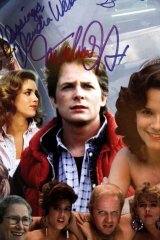 He would later use the middle initial "J" professionally, in order to distinguish himself from another actor named Michael Fox. 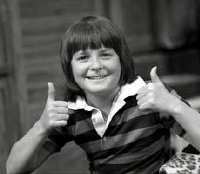 He was the youngest of five children born to Bill and Phyllis Fox. He struggled in school to compete in his favourite activity, ice hockey, because of his height (he is only 5' 4"), and instead turned his attentions to drama. I was delighted to meet Michael J. Fox, star of one of my favourite film series, Back To The Future, at the London Film and Comic Convention held at Olympia in July 2015. 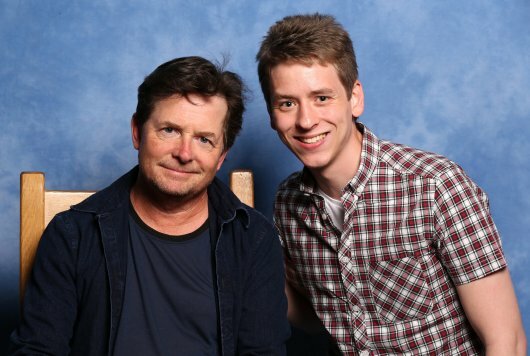 It was a very rare opportunity to have my photograph taken with him. 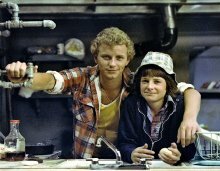 in 1982 as Alex P. Keaton in 171 episodes of the TV series Family Ties (1982-1989), and it’s spin-off TV movie Family Ties Vacation (1985). 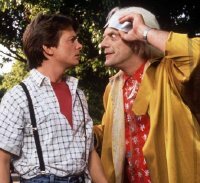 In 1985 came Fox’s first great success on the big screen, playing Marty McFly in Robert Zemeckis's zany romp Back to the Future (1985). 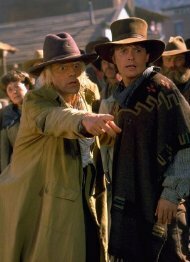 This film, co-starring Christopher Lloyd as Dr Emmet Brown, has acquired a huge following, both in America and the UK. 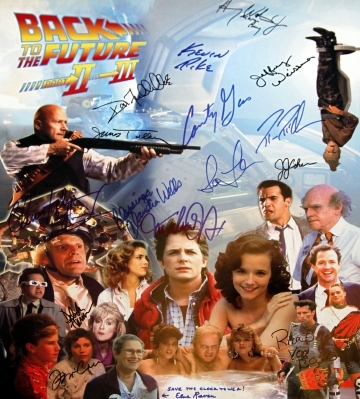 The sequels Back to the Future II (1989) and Back to the Future III (1990) followed soon afterwards, and were equally well received by audiences. for his starring role as Eriksson in Brian De Palma's Vietnam saga Casualties of War (1989). his return to primetime TV, playing Mike Flaherty in the ABC sitcom Spin City (1996-2001), that put Fox back in the public eye. Not only did he delight audiences on a weekly basis, but the schedule allowed him more time with his family. In 1999, Fox voiced the title character (a little white mouse) in the film adaptation of the children's book by E.B.White called Stuart Little. work since has been TV based. 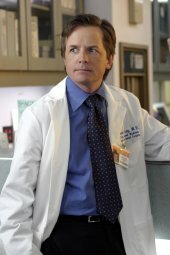 He guest-starred in the TV comedy Scrubs (2004) as Dr. Kevin Casey, a surgeon with obsessive-compulsive disorder. 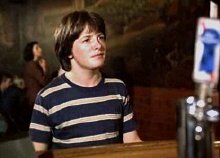 He appeared in the recurring role of Daniel Post in six episodes of the drama Boston Legal (2006), for which he gained an Emmy nomination (Best Guest appearance). Appearance). Fox played the character Dwight in six episodes of the dark drama series Rescue Me (2009), and in the same year, his TV special Michael J. Fox: Adventures of an Incurable Optimist, based on his best-selling book of the same title, was aired on ABC. which Fox won both an Emmy and a Golden Globe, he announced in early 2000 that he would be leaving the show after its 100th episode, to spend time with his family and to concentrate on raising money and awareness for Parkinson's disease. 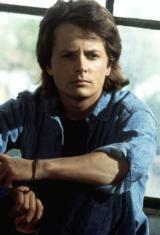 In 1988, Fox married actress Tracy Pollan (who played Alex Keaton's girlfriend Ellen, in Family Ties). The couple has four children - son Sam, twin girls Aquinnah and Schuyler, and daughter Esmé. 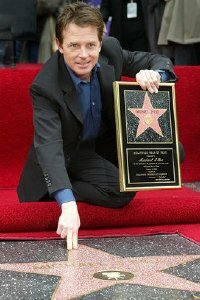 In December 2002, Fox was honoured with a star on the famous Hollywood Walk of Fame. Parkinson's Research, a non-profit organization dedicated to finding a cure for Parkinson's disease.